Aquatint of the water powered mill at Cromac, in Belfast, Ireland, was drawn by T. C. Thompson. 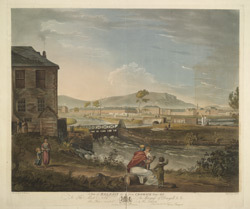 The mill can be seen to the left of the picture with a young family seated in the foreground, and the city of Belfast in the background. In the 19th century Belfast was a rapidly expanding commercial and manufacturing centre with a large number of mills and engineering works.